We pursue excellence in teaching and learning, seeking to give our students the gift of bilingualism and the skills needed of a global citizen in the 21st century. Achieve functional proficiency in English for academic and personal purposes. 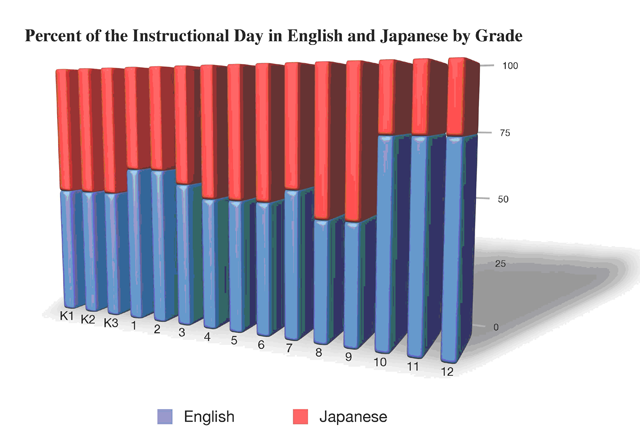 Maintain Japanese language development at the same level or higher than non-immersion students. Master subject content at their appropriate grade level. Students acquire the knowledge and competencies expected of students by both the Japanese Ministry of Education and the International Baccalaureate Organization. Develop 21st century skills and competencies exemplified in the International Baccalaureate’s Learner Profile. Become global citizens who are globally minded and interculturally aware while maintaining their own Japanese cultural identity. The underlying principles of the program are based upon the guidelines established by the Japanese Ministry of Education, the International Baccalaureate Organization at the secondary level, and the most current understanding of how languages are best learned. The program emphasizes a dynamic combination of knowledge, skills, experience, and critical thinking. It seeks to promote high academic achievement, confident risk-takers and responsible global citizens while developing high levels of proficiency in a foreign language. Ultimately, it is hoped that students will develop a genuine love of learning, a respect for individual differences, a willingness to seek challenges, and disciplined habits of mind and body that will guide them and be a source of strength and enjoyment throughout their life. Rigorous. The content of the program, especially in the years of Kindergarten – Junior High School, is based upon the very demanding Japanese national curriculum. The content taught in the English Immersion & Bilingual Program essentially mirrors the content of the other programs at Katoh Gakuen. High standards and expectations are placed on students in the program. At the secondary level students must also meet all IB requirements. The approach to teaching and learning in the English Immersion & Bilingual Program embraces and transcends the traditional Japanese focus on content and requires students to become critical thinkers and creative problem solvers. Graduates of the program are expected to have thorough understanding of the basic skills and knowledge in the traditional subject areas and the ability to apply these in unique and creative ways. Throughout the program we seek to develop students who are confident risk-takers unafraid of life’s challenges. Holistic. While insisting upon a thorough study of the various disciplines, the English Immersion & Bilingual Program accentuates the inter-relatedness of subject areas and advances a holistic view of knowledge. In this way, the curriculum promotes the development of the whole person. This interdisciplinary perspective asks students to consider issues and problems in their widest scope and to realize that good solutions often draw upon insights one has acquired from many sources. We are holistic in that we teach to the whole child to promote physical, emotional, moral, social, spiritual, and aesthetic development. We seek to create a supportive, caring, and nurturing environment for children. Integral to this holistic approach is the development of the ten attributes of the International Baccalaureate’s Learner Profile. Intercultural Awareness. As participants of a highly interconnected and rapidly changing world, it is important that students develop international-mindedness within a global context. We create learning environments where students not only learn about the world through the IB curriculum but also through their interactions with other people. We also believe students must have a solid understanding of their own Japanese language and culture. Our aim is to ensure students have a deep appreciation of their own Japanese heritage, with the skills and understanding necessary to be more globally engaged. Communication. Within this holistic, intercultural education, the English Immersion / Bilingual Program stresses the importance of communication in two or more languages as a fundamental ingredient in the achievement of the program’s goals. Learning to communicate in a variety of ways in more than one language is not only essential to the development of intercultural awareness; it is critical to living productively in an interconnected, global community. At minimum, we believe that it is essential for young people entering today’s society to have native level command of Japanese and the ability to communicate effectively in English. Learning Through Two Languages. This principle points to the process used to achieve our goals and is at the core of our instructional approach. It is the crucial feature of our program that enables us to achieve our ambitious goals and is at the heart of everything we do. Research has shown that second language instruction that is integrated with content instruction is the most effective way to teach a foreign language. Language is best learned when it is embedded in a rich and highly meaningful communicative context. The incentive for learning the language comes from the student’s desire to understand and be understood within this foreign language environment. The weakness of conventional methods of foreign language instruction is that it dissociates language from the student’s cognitive and social development. Immersion education is effective because it builds upon these domains and presents language in meaningful and significant social and academic situations. The added benefit of this is that immersion education has been shown to be cognitively stimulating resulting in greater sensitivity to one’s first language, improved analogical reasoning and increased cognitive flexibility.